Tonight I am pretty stoked to be able to unleash some new mopehead music on you. It has been a LONG time since I've recorded any mopehead tracks. I think it has been somewhere around 8 or 9 years. Too long. Special thanks to my wife who bought me an Apogee One to hook up to my iPad 2 and with a few other pieces (and Garage Band) I threw this track together. 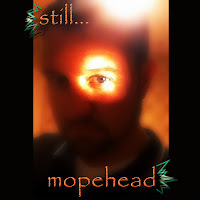 This song is called "take your time" from the upcoming NEW mopehead album "still...mopehead". I'm going to work hard towards busting this project out and then do all that I can to keep it up. There are some limitations to this recording process - only 8 tracks - and I'll need to see about using my other gear, but for now the ability to record guitar, bass, drums, vocals and piano is amazing.